The narrative below is by no means a complete analysis of the process involved with multiplying small group ministry, but it provides some insights from personal experience. I’ve tried to break up this analysis into various aspects that I think are important to consider when heading into small group multiplication. Before I go into these different aspects, I thought it might be appropriate to share some history related to my small group ministry experience. My wife and I started attending Christ’s Church of the Valley more than ten years ago. When we first started attending, we struggled with finding real connection at the church. Since we met in a movie theater, we never had a lot of time before or after our normal Sunday church time to establish relationships with anyone else at the church. Realizing that this would take some effort on our part, we decided to try out a new “marriage building” workshop. This twelve week workshop gave my wife and I a chance to meet people and begin deeper relationships with others at the church. Out of this workshop, our first small group was started. For the first couple of months, it was basically one other couple meeting at our house every other week. Over time, our group grew a couple at a time. When we started a study based on “40 Days of Purpose” by Rick Warren in January 2004, we were averaging 18 to 20 adults (along with many children) at our weekly meetings. Heading into this study, we realized we needed to make decisions about the future of our group. At the end of this study, we “birthed” into two groups. After this “birthing” process, I did not imagine having to go through it again for a while. I guess God had other plans, because in January 2005 we went through the process again when our group ballooned to 30 adults (and over 20 children). This time we “birthed” into three groups. Going through these times of transition was not easy at all (especially when you don’t enjoy change – like me); however, I am convinced that it was the right thing to do both times. Hopefully, the tips below will help you in addressing this process at your own church or with your own group. As our group developed, we were committed to fostering an environment where new people were always welcome. We refer to this as the “Open Chair Policy.” We always try to have an open chair at our meetings as a reminder to be praying about who God might be sending to our group. A major reason for this policy is our commitment to contributing to the Great Commission (see Matthew 28:19, 20). I’m also convinced that this was how the early church worked. Acts 2:42-47 describes the early church and clearly shows that God was adding to their numbers daily. I believe they had some sort of open chair policy in place. If the early church had closed its doors to outsiders, the church today would certainly not be the same (if it even existed). Similarly, the courage of someone sharing their faith with us was probably the driving force for our own faith. We have the privilege and obligation to share this with others. Helping your group to understand this is extremely important. Yes, the small group exists to help them grow and experience fellowship, yet it is also there to help fulfill the Great Commission. A man in our first group shared one night during our discussion about this issue, that we are telling others (non-believers who might be interested in attending our group, but won’t or can’t because our group has gotten to big) that they can “go to hell,” because we are too selfish to go through the pain of birthing our group. His comment helped our group understand the need for this process. The birthing process also gives current members a chance to invite friends, relatives, associates, and neighbors to their group. 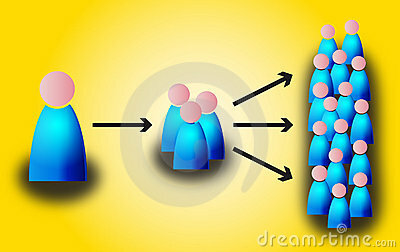 When the group gets to a certain level, small group members become reluctant to bring others to the group. Another positive about the birthing process is that it allows for deeper intimacy. When your group is approaching 20-30 people, it becomes a real challenge to keep the deep connections going. As a group leader, it also becomes a real challenge to shepherd a group of this size also. Even Jesus did not have a group of this size. His example of 12 or 13 seems much more manageable. I would even propose that a group size of 8 to 12 is about as big as a group should get. For our group another positive about this process related to the whole childcare issue. Our group has made every effort to provide childcare. As a result, our group growth as been predominately marked by families with kids. Trying to coral a large number of kids into someone’s basement or backyard isn’t fair or safe for the kids or the sitters. By birthing, our new groups have been able to more effectively handle the childcare issues. Communicating these positives is essential to helping group members understand the benefits and the need for going through the “birthing” process. As a small group leader and as a “people pleaser,” I am always concerned about the thoughts and feelings of those in my group. I want them to understand and be happy with the decision to birth. Unfortunately, group members don’t always get it right away. Like me, they don’t like change, and they don’t understand why it is so necessary. It’s important for small group leaders to listen to the people in the group as they wrestle through this time of transition. We talked about it at our weekly meetings which I’ll mention later, but I also tried to call or speak to each individual in the group personally (especially the first time) to give them an opportunity to voice their opinions. I believe this provides an essential opportunity for group members to grow into the decision to birth new groups. Group leaders also need a coach or point person that they can lean on for support through this time. This person not only acts as a sounding board but also as a cheerleader. A small group leader should not feel like they are swimming through this process alone. They need an encourager and a backup. This process could never happen without prayer. Small group leaders need to be praying for their group. Church leadership needs to be praying for the small group leaders and for the effective growth of the small group ministry. Each small group should also be praying for the “Open Chair” and for the future of the group as it looks towards birthing. As our group began to discuss this topic, we tried to start and/or end each discussion with prayer. Prayer has probably been the biggest highlight of the actual birthing process for our groups. At our last meeting together as a whole group, we spent time commissioning the new groups through prayer. This provided a beautiful time to thank God for his work in our group up to this point and to ask for grace and guidance for the new groups. Another important aspect to the birthing process is the building up of new leaders. I recommend appointing an apprentice leader to each small group early in the life of the group. I also believe it’s important to provide plenty of opportunities for the apprentices to have leadership in the group. Initially, this may mean assigning the apprentice to a task or two at each meeting (i.e. Ice Breaker Leadership or Announcements). Eventually, the apprentice should be encouraged to lead the entire meeting. This provides an opportunity for the apprentice to become comfortable leading the group, and it also gives the group a chance to become comfortable with the apprentice. One way we approached this was by splitting the group into two or three groups for the discussion part of the evening. This allowed for more intimate discussion, and it gave the apprentice a valuable opportunity to lead. Apprentices should also be included in the small group ministry support activities. At our church, group leaders and apprentices meet quarterly along with the small group coaches/team leaders. At these meeting, we are challenged by visions for the future, we are encouraged to huddle with others to learn from each other and to pray for each other, and we are educated with new skills that will help us effectively lead our small groups. The small group should be involved in the decision to birth. Groups should together establish a charter that recognizes that the birthing process is inevitable and important. As the actual birth approaches, time should be set aside at a couple of meetings so the group can talk about the process and the logistics (who is going where, etc.). In some cases it might be beneficial for the apprentice to make some phone calls to nail down the location for their future meetings and to ask people to consider joining their new group. Through this discussion, the group may be able to easily divide the groups based on geography or age of children. In other cases, group members may just want the leaders to determine which new group each person should end up in. Again, prayer through this whole process is crucial. A helpful way to get your groups through this process is to plan a reunion event of some sort (i.e. covered dish picnic). This will be a neat opportunity to see each other again and to meet the new people who have experienced real community as a result of the birthing process. This will also be an opportunity to celebrate and to encourage continued involvement in this process. The first time was the toughest. The second time was a bit easier. As people in your church and in your small groups adjust to this process, it will hopefully become easier. Looking ahead, I see a church full of small groups that provide true community and unbelievable outreach and growth. I could probably share many other things about my journey through this process (maybe I’ll have the chance sometime), and I realize I have much more to learn. In the meantime, I hope this brief narrative will be helpful as you approach the small group ministry birthing process. What tips to you have to add relating to the “birthing” process? Have you ever experienced this process? How did it go?